The supremacy of Six Degrees of Kevin Bacon—hosted, appropriately, on The Oracle of Bacon—is being challenged by a fierce new competitor: Vince Gill. The country star recently launched “6 Degrees Of Music With Vince Gill”(subtitle: “License To Gill”), which tracks how he’s connected to the rest of the music industry. The site is remarkably comprehensive, as it uses a database culled from the online music encyclopedia MusicBrainz containing “around a million musicians and around 18 million records and individual tracks,” and it’s also highly customizable: Users can cherrypick genres to include or exclude, and can see Gill’s connections to people such as arrangers, engineers, and publishers. While some of the results are predictable—he has a “Vince Gill Number” of one to Taylor Swift, since the pair performed “Red” together at the 2013 CMAs—the musician has rather close ties to some unexpected figures. 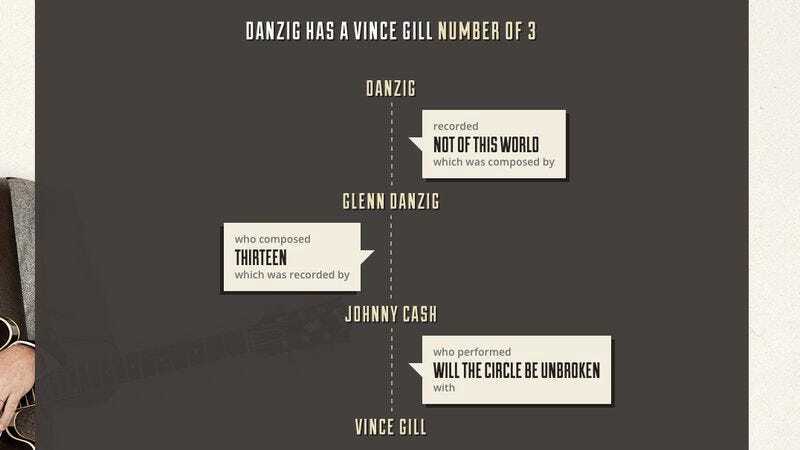 Gill is three steps away from Danzig mainly because of the song “Thirteen” the latter wrote for Johnny Cash, and two away from Justin Bieber, since both covered the song “Santa Claus Is Coming to Town.” And he’s a mere two from Steve Albini: Bob Ezrin helped edit Nine Inch Nails’ The Fragile—to which Albini contributed—and also co-wrote Alice Cooper’s “A Runaway Train,” on which Gill contributed guitar.